THREE Liverpool legends have been voted into the National Football Museum's Hall of Fame. World Cup winner Roger Hunt, all-time leading scorer Ian Rush and classy defender Alan Hansen will be formally inducted at a special awards ceremony at Liverpool's Crowne Plaza Hotel on Thursday, October 19. Prolific striker Hunt, who made 492 appearances for the Reds between 1959 and 1970, won two titles and one FA Cup during his stay at Anfield. His haul of 245 league goals stands as a club record, as does his total of 41 goals during 1961/62. Rush made 658 appearances in two stints at Anfield, scoring a record 346 goals. The Welshman won five titles, five League Cups, three FA Cups and the European Cup. The deadly frontman notched a record 44 FA Cup goals and his five goals in FA Cup finals is an all-time record. He also holds the Merseyside derby scoring record with 25 goals. Skilful centre-half Hansen's defensive prowess played a keyrole in Liverpool's dominance in the late 70s and 80s. The Scottish international captained the Reds to the league and cup double in 1986 and was one of Bob Paisley's most inspired signings. His list of honours included three European Cups and eight league titles. Reds legend Kenny Dalglish, who entered the Hall of Fame in 2002, has hailed the decision. "The contribution that all three made to Liverpool Football Club was immense," he said. "Roger came some time before big Al and Tosh but the goals he scored, along with what Bill Shankly did at Anfield, was one of the main reasons the club is where it is today. "They were the ones who started it all off and to see Roger getting recognised like this is really brilliant for him. But don't forget he's already had a knighthood from the Liverpool fans! "Big Al thoroughly deserves it. In some ways he was a bit unlucky. He was captain of the double winning team in '86 but because I was player manager he never really got the recognition he deserved. I'm talking publicly of course because privately he most certainly did. "He was a big reason for the success in my period. What he did off the pitch was every bit as great a contribution as what he did on it. "As for Rushie, his two spells at the club speak for themselves and he thor-oughly deserves to be in there. Both he and Roger were top class goal scorers. But Rushie's movement outside the box was probably a bit more than Roger's and he was also an under-rated passer of the ball. "The three of them would probably get into any all-time best Liverpool squad." The other players on the list for 2006 are former Newcastle striker Jackie Milburn, Hunt's former England team-mate Martin Peters, Arsenal legend Liam Brady and ex-Chelsea star Gianfranco Zola. Former West Ham and England boss Ron Greenwood and current Arsenal chief Arsene Wenger have been voted into the managers category. All the living inductees have confirmed their intention to attend the ceremony at the Crowne Plaza, while Milburn, who died in 1988, and Greenwood, who died in February this year, will be represented by their sons. Launched in 2002, the Hall of Fame celebrates the greatest players and managers of all time in English football. After his induction as a manager in 2005, Blues legend Howard Kendall formed part of an elite selection panel, including Sir Alex Ferguson and Sir Bobby Charlton. Kendall said: "There were some hard choices to make, but I think the panel has again selected players and managers of a truly high quality." Tickets for the awards ceremony cost £150, including a champagne reception and dinner. There are a variety of packages for group bookings and opportunities to sponsor inductees. All proceeds go to support the work of the museum, particularly its educational and social programmes. ini ada artikel bagus tentang "Sir" Roger Hunt, striker legendaris LFC yang ikut memenangkan 1966 World Cup bersama Inggris. From his position on the bench, Harold Shepherdson was struck by the reaction of the England players when Roger Hunt scored his second goal against France at Wembley in 1966. "Instead of the usual dignified congratulations when a man scores," the England trainer recalled later," the players ran over and mobbed Roger in celebration." Inside the stadium the sense of relief, Shepherdson noted, was palpable. In scoring his third goal in as many group games, Hunt guaranteed England's progress to the knock-out stage of the World Cup. Such exuberant behaviour, then a rare sight in football, was proof of Hunt's popularity and the professional respect he commanded in the dressing-room. Disappointed with England's attitude and performance in beating France 2-0, Alf Ramsey accused the team of complacency at a hastily-convened meeting. He made one exception. "Roger always has the right attitude," was the gist of Ramsey's message to the squad. "He always plays well." In 16 appearances for his country, Hunt had scored a remarkable 15 goals. "And even if he didn't score," Martin Peters observed later, "we all knew that Roger would run his socks off for the good of the team." He'd found form at exactly the right time. From squad regular, he'd made himself an automatic choice in a matter of weeks. Now he was arguably England's best player during the group stage. He wasn't making the headlines, though, despite being the team's leading goalscorer. (He even helped create England's other goal, a spectacular long-range shot by Bobby Charlton against Mexico. "Roger made a fantastic decoy run," Charlton said). In the days following the France game, the football reporters were more interested in the injury sustained by Jimmy Greaves (a badly gashed shin) and Nobby Stiles, whose tackling was upsetting various Frenchmen and FIFA officials. "Most of the football writers back then didn't grasp his importance to the England side, but, believe me, the England players did under-estimate his contribution," Stiles told Football365. "Roger always put the interests of the team first." In Hunt's case, that meant playing a different role to the one he performed at club level. At Liverpool, Hunt was regarded as a specialist goalscorer. "It was his job to get on the end of things in the penalty area," team-mate Ian Callaghan explained. "Bill Shankly didn't want him chasing about all over the place, wasting energy." To get the ball to him, Liverpool employed two specialist wingers in Callaghan and Peter Thompson. "We wanted him to concentrate on goalscoring, in the same way Jimmy Greaves did at Tottenham," Shankly explained later. "Mind you, Roger didn't just slide them in quietly, like Jimmy. He blasted them in." "Alf always picked the same core of players in 1966," Stiles said, "and Roger was one of them." Selected for the final against West Germany, Hunt again ran his marker ragged, as Ramsey instructed. It diminished his chances of scoring, but tactically, it did the trick; crucially, when England equalised, it was Hunt who dragged Wolfgang Weber badly out of position, creating the space for Geoff Hurst to score. Though subsequently nicknamed 'Sir Roger' by his Liverpool and England team-mates and the Kop, the demands of the World Cup seemed to drain Hunt both physically and psychologically. The following season he struggled for form with Liverpool and, in 1967, he was dropped from the England team by Ramsey, albeit briefly. Even though his overall scoring rate, for both club and country, slowed markedly in the second half of the decade, he remained an England regular until January 1969, when he finally decided he'd had enough. He'd never been a favourite of the Wembley crowd; their favourite had always been Greaves, the local lad. Hunt walked away from international football following his appearance against Romania, despite being part of Ramsey's plans for the 1970 World Cup. "You mean you won't be coming with me to Mexico, Roger?" was the manager's disappointed response when informed of the decision. Based on results, such loyalty was understandable: Hunt was selected 34 times by Ramsey, and he scored 18 goals; more significantly, perhaps, in the seven years since his debut, England had lost only two games in which he played. In April 1972, his former England team-mates showed their appreciation by turning up in force (with 56,000 Liverpool fans) for his testimonial at Anfield. It was more than two years since his last game for Liverpool, having scored a club record 245 League goals in the decade since his debut in 1959. "I was always glad to see Roger beside me in the England team," Bobby Charlton said at the time. "You could make huge plans around him, and he was greatly missed when he wasn't there." "Roger did not receive the credit he deserved from the public nor the press in 1966," Nobby Stiles told the author over forty years later. "So it's great to see him get more recognition today. Roger was also a pillar of the Shankly side that won two titles and the FA Cup during the mid-sixties. He fully deserves his place in the Hall of Fame, because he's one of English football's most underrated players." A tale about two people really, Ian and Bob. "If you're saying you want to go, you can go," Bob Paisley said, in a quiet voice. "It's up to you. What do you want to do?" For Ian Rush, the answer was easy: after a year or so at Liverpool, all he wanted to do was get away. By now he hated the sight of Anfield - and most of the players. At that moment, standing at the door of Paisley's office, Rush was convinced that his future lay elsewhere. In his mind, the manager didn't care if he stayed or not. As far as Rush was concerned, he was now on the transfer list. "You can stick the club," Rush said - or words to that effect. Looking up from his desk, Paisley had one last word of advice for his reserve striker. "We bought you to score goals, Ian," he said. "Why don't you go and do that?" The previous year Paisley had in fact paid Chester a fee of £330,000, a record sum for a 17-year-old. Seventeen goals in 38 games got him noticed, but it was proving a big step up from the Third Division. One of the problems was a lack of confidence. It was the same at Chester. Asked by the manager if he was ready for first-team football, all Rush could manage in reply was a mumbled, "Dunno." Exasperated, Alan Oakes asked the question again. "I'll give it a go," Rush said. Even the thought of joining Liverpool daunted him. Not only wasn't he good enough, he feared he'd make a fool of himself if he tried. He did sign eventually - but only after the champions came in for him a second time. On his first day at Anfield, Rush turned up wearing corduroy drainpipes. The senior players, of course, took the piss mercilessly. Rush took it all to heart. On the field, he was often anonymous; it was if he was deliberately trying not to draw attention to himself. And when the banter started in the dressing-room, he kept his mouth shut. It wasn't long, however, before he hated the sight of his fellow players. "Football is a ruthless, demanding business," Rush wrote several years later. "The players were testing me. At Anfield you either learn to swim, or sink. I guess I spent most of my first year there sinking." In seven first-team appearances that season, Rush had yet to score; his strike-rate for the reserves in 1980-81 wasn't much better. Several people at Anfield thought it was time for the club to cut its losses and sell him. Matters, inevitably, came to a head. When he didn't even make the bench for the European Cup final against Real Madrid in Paris, Rush decided to confront Paisley. He wanted to know why he wasn't in the first time. And as we've read, Rush didn't much like what he heard when Paisley told him bluntly that he wasn't good enough. "I've watched you in matches and in training. All you ever want to do is play possession football, lay it off all the time. You've got to take more responsibility. You haven't scored a goal for us yet. Paisley wasn't finished yet. "When you get in the box you need to be more selfish. It's up to you to play your own game when you're within shooting distance. It might be a team game, but you've got to look after yourself." Though he didn't realise it at the time, this was the crucial turning point in Rush's career. "I'll show you I can score goals," he shouted back, slamming the door of the office in the process. 'I'll play for myself in the reserves,' he told himself. 'Then, if I score enough goals, another club will come in for me.' (In fact, only Crystal Palace, then a Second Division side, showed any interest when news of his unrest filtered out of Anfield). In his first five games in the reserves the following season, Rush scored six goals - half his total for the whole of the previous campaign. He wasn't doing much else for the team, but he didn't care. He was scoring goals and that meant he was more likely to get a transfer. That's all he cared about. Then, when David Johnson was ruled out because of injury, that autumn, Paisley called him up for the League Cup tie against Exeter. Rush scored twice. He was just as selfish in the first team as he'd been for the reserves. Paisley kept him in the side. It was the start of an incredible run: over the next six seasons Rush scored nearly 200 goals for Liverpool, at an average strike rate of two goals every three games. Only later did Rush come to understand what had happened that day in Paisley's office. "Bob was a genius when it came to human nature," he wrote in 1996. "Looking back now, I think he looked at my character and decided that the way to get the best out of me was to make me angry. That's why he gave me the lecture about not scoring enough goals and not being selfish enough. He used psychology to make me do exactly what he wanted me to do." Get well soon Tommy Smith, YNWA. Anfield legend Tommy Smith is recovering in hospital after suffering a heart attack at his Crosby home yesterday. The tough tackling defender - nicknamed The Anfield Iron during his time with the Reds - was mowing the lawn when he collapsed with chest pains. An ambulance was called by his wife Sue to transfer the 62 year old to Fazakerley Hospital. He is expected to remain there until the weekend. Anfield spokesman Ian Cotton said today: "Everyone at Liverpool sends Tommy their very best wishes for a speedy recovery. "He's a legend of the club and remains a very popular figure in the press box on match days. We look forward to seeing him again fit and well next season." 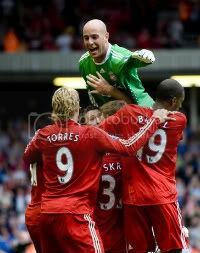 Former team-mate Ian Callaghan added: "I'm shocked to hear about this – he is so indestructible. But he is on the go all the time doing things. "Only last week we were together for a lunch at the Crowne Plaza. Maybe this is just a little warning. "Best wishes of all former players go to Smithy who we are sure will be up and about before long." Legend, wishing you a speedy recovery... YNWA. .tv wrote: Smith, 62, collapsed with chest pains while mowing the lawn at his Crosby home and, although he's recovering well in Fazakerly Hospital, he now faces a triple heart bypass operation. The former Anfield skipper said: "I have been in a while now and I feel an awful lot better. But I know that shortly I will be having a triple by-pass. I am not really looking forward to it. "I just want to get the operation done and start living and enjoy life again." Smith, bersama 'Rowdy' Yeats, adalah duet bek tengah yg jd bagian kesuksesan LFC era Shankly tahun 60an. Smith n Yeats di tengah, Chris Lawler di kanan, dan Gerry Byrne di kirì jd kwartet pertahanan nan tangguh yg antara lain berandil besar mempersembahkan FA Cup pertama kalì tahun 1965 dengan mengalahkan Leeds Utd pada final di Wembley. Setelah Ron Yeats menjadi kapten selama 10 tahun (terlama dalam sejarah LFC), tahun 1970 ban kapten disematkan Shankly kepada The Iron Smithy selama lebih darì 3 tahun sebelum dìgantikan oleh kapten Champions '77 & '78, Emlyn 'Crazy Horse' Hughes (RIP). Smìthy jg dikenal dengan gol sundulannya ke gawang Kneib--kiper Gladbach--pada Final Champions '77 di Olimpico Roma yang merupakan gol ke-2 LFC dalam pertandingan tsb. Sebelum sakit, ia adalah penulis artikel reguler LFC dì media terkenal Merseyside, Liverpool Echo. Yang tak kalah pentìng tentunya Smìthy adalah scouser yang dilahirkan di distrik Anfield. Smoga operasì pemain legendaris ini berjalan lancar dan kondisi fisiknya segera pulìh. YNWA, Smìthy! Hidup merupakan perpaduan antara warna dan warni. Selama kita bisa menikmatinya, komposisi apapun yang terbentuk akan tetap menjadi lukisan yang indah. Ada artikel menarik di Football365.com, membahas salah satu bek legendaris kita, Daniel Agger Sr.. eh, maksudnya Alan Hansen . The message, driven home all the more forcefully if the new signing happened to be a defender, was always the same: Liverpool are a passing side. Give and go. The team, not the individual. But they made an exception for Hansen, their tall, stylish centre-back. 'Liverpool gave me the licence to be myself,' the Scot said, recalling his special status at Anfield. As a boy, Hansen modelled himself on Bobby Moore; like Moore, his game was all about anticipation, reading the play, and skill on the ball. 'My number-one attribute was my ability to involve myself in the attacking play. For me, it was all about getting the ball and 'playing' - making constructive passes and pushing forward to get the ball back, or taking the ball past opponents.' Which was exactly what Moran didn't want anyone else to do. Signed by Bob Paisley from Partick Thistle in 1977 for a fee of £100,000, a paltry sum even then, Hansen played 621 games for Liverpool. By the time he retired, in 1991, he had amassed eight League championship medals, two FA Cup and three League Cup gongs and three European Cup medals. In those 14 years there was only one season when Liverpool finished lower than second in the table, and only two seasons when they failed to land a trophy. Tactically, Liverpool's flat back-four pushed up in order to compress the play. They didn't deliberately play for offside, however. 'We pushed up with the intention of making it difficult for opponents to give their strikers the service they wanted to give them, and to keep the ball a safe distance from goal.' Here again, his ability to read the play - when to let the striker go, knowing that he'd be ruled offside - was crucial. And for all his height, he wasn't much good in the air, either. Yet for all that, Liverpool, time and again, boasted the best defensive record in the division. Meantime, workplace pressure was mounting inexorably. Fearful of failure, Hansen had always suffered nerves before a game (they disappeared as soon as he ran out on to the pitch); now, the strain of keeping Liverpool on top was getting to him more and more. He'd never taken criticism well, either, which didn't help. 'Hypersensitive,' as he put it. So, when, as a way of coping, he got into a habit of downing a few pints at lunchtime, he realized it was time to pack it in. Physically and mentally, he'd had enough. Liverpool, as everyone knows, haven't won a title since. Robert is the author of the excellent Football's Greatest Heroes, and also works in association with The National Football Museum. Kebetulan bgt kemaren aku baru ngliat video 100 PWSTK-nya Alan Hansen. Akhirnya bisa secara langsung (dlm bentuk rekaman, maksudnya) ngeliat aksi2 pemain legendaris ini. Walopun posisinya CB, dia sering merangsek ke depan utk membantu penyerangan. Terlihat pada pengakuannya di paragraf ketiga, "I love to be involved in attacking play". Malah di cuplikan video kemaren isinya penuh dgn gol2 yg pernah ia buat selama bermain utk Liverpool. Mudah2an Agger bisa mengikuti jejak Hansen, walo di judul artikel disebut Never A New Hansen. PS: Jadi inget dulu aku pernah nyangka Alan Hansen tu orang Denmark, gara2 ada nama Hansen-nya. Untung dikoreksi ama siapa ya waktu itu, redianfield klo ga salah, dikasitau klo Hansen itu asal Skotlandia . Your Hall of Fame feature on Alan Hansen reminded me of a time we bumped into him in Glasgow a couple of years ago. My friends and I were over to watch the famous Glasgow Celtic play...and the worse for wear on the day of the game, we happened to stroll by a sports shop with a sign stating 'Alan Hansen signing his new book today from 11am'. I looked at my watch and it was literally 11:01am, so we meandered into the shop only to see Alan standing on his toblerone (as the undoubted rush had not started yet we'd hoped). We went up to him and just started talking to him and he was a great chap from the off. After a minute or two, he asked what us Dublin boys were doing in Glasgow, to which I replied 'We flew over here just to get you to sign your new book'... Alan Hansen turned all doey-eyed, and appreciative, reinforcing his legendary status with a humble streak - he said optimistically "Really? "...to which I replied "No!" and started laughing. The great man then laughed very heartily and supplied us with free photos of the occasion. Stay logged on to Liverpoolfc.tv all next week as we celebrate the 30th anniversary of King Kenny signing for the club with Dalglish Week. Apa yg perlu dijelasin? Udah jelas kan minggu ini adalah Dalglish Week merayakan 30 tahun gabungnya King Kenny dari Glasgow Celtic ke LFC. saya juga ngak tahu dimana mouse saya diletakkan. The Liverpool players felt as if they were growing in stature with his every word. 'David Sadler,' Shanks continued. 'Wouldn't get a place in our reserves. And finally, John Aston. A chicken, hit him once and you'll never hear from him again. As the manager finished his demolition job on United, Emlyn Hughes raised his hand. 'That's all very well, boss,' he said, 'but you haven't mentioned George Best, Denis Law or Bobby Charlton.' Shanks turned on him. 'You mean to tell me we can't beat a team that has only three players in it?' he said, glowering.